A luxury self catering House located on a private working farm outside of Underberg District. The House has all the home comforts set in a beautifully landscaped garden overlooking the Ukhlamba Mountain range. The House offers 2 lounges with fireplace of which the larger main one opens onto a huge verandah overlooking the garden. The second lounge forms part of the diningroom which opens onto a smaller verandah also looking out onto the garden. The kitchen is fully equipped and there is a larder available. There is 2 weber braai's available as well as a small weber gas braai. There are 5 large, luxurious and comfortable bedrooms. 1 is en-suite with bath/shower attachment and toilet. There is another seperate toilet facility, bath/toilet facility and shower/toilet facility available as well. All facilities have guest amentities available ie shampoo, body wash and hand cream. All rooms have heated blankets, hairdryers, extra blankets, king or twin beds and have views of garden and farm. Should one wish to fly in, there is an airstrip available. We are pet friendly and welcome your furry four legged family happily. There are plenty of activities available which are suitable for young and old alike - walking and mountain biking around the farm premises, trout fly-fishing, swimming, canoeing and bird watching. We are 20 kms from Underberg and there are many local attractions ie trips up Sani Pass , golfing, horse riding, musuems, tubing on Umzimkulu River and many more. We also allow for children to getting up close and personal with lambs and calves when in season. Feeding of them is allowed under supervision. We also have tubes at the House as well as life jackets when children on dam. The House has 24 hour security and is very secure. 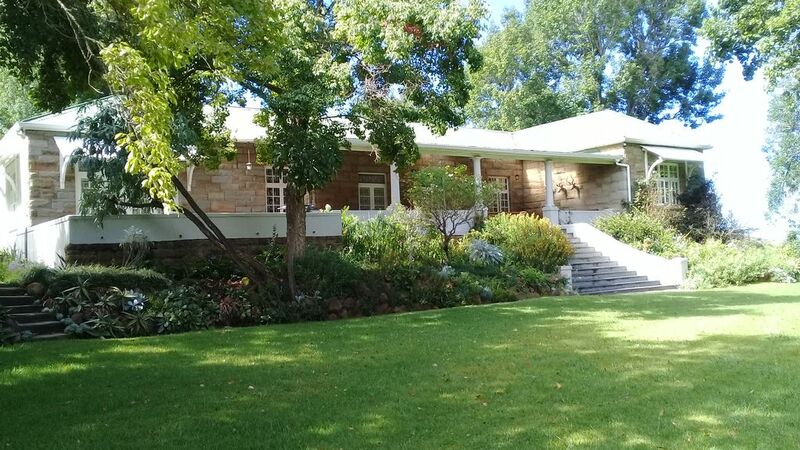 Even though House at Glengariff seems off the beaten track, it is the perfect getaway for family/friends to enjoy freedom and an inexpensive way to explore the charms of the Southern Drakensberg and to experience great hospitality. Views are breathtaking! Privacy, relaxation, and tranquillity are assured. i AM VERY PASSIONATE ABOUT THE HOSPITALITY INDUSTRY AND STRIVE TO OFFER GREAT SERVICE AT AFFORDABLE PRICES . I AM VERY MUCH A PEOPLE'S PERSON AND IT GIVES ME GREAT SATISFACTION SEEING FOLK APPRECIATING AND ENJOYING THEMSELVES. I AM EASYGOING, ALWAYS WILLING, HONEST INDIVIDUAL. ENJOY THE SIMPLE PLEASURES OF LIFE. THIS HOMESTEAD IS A BEAUTIFUL OLD FARMHOUSE MADE OF SANDSTONE FROM THE 1900'S. THE VIEW OF MOUNTAINS AND THE LARGE LANDSCAPED GARDEN MAKES THIS A HOME FROM HOME EXPERIENCE. ITS THE PERFECT RETREAT TO ENJOY WITH FAMILIES AND FRIENDS. THE VIEWS FROM THE LARGE OPEN VERANDAH , SPACIOUSNESS, TRANQUILITY ASSURED - COUNTRY LIVING AT ITS BEST. This dining area seats 10- 12 people and has an open plan small lounge with fireplace and opens up onto small verandah overlooking landscaped garden and mountain views.